Home Engineering Computer and IT Codathon’19: Inter-NIT Coding Contest @ MANIT, Bhopal : Results Announced! Codathon is an Inter-NIT coding contest, the first of its kind and the brainchild of ISTE Students’ Chapter MANIT. Codathon kickstarts ISTE SC MANIT’s Annual Students’ Conclave ‘Chimera’. Codathon will be a week-long contest with seven questions unraveled over seven days with increasing difficulty. Although the prizes are reserved for students of NITs, the contest is open to all those who have a knack for programming and consider solving algorithmic questions a healthy mental exercise. Moreover, if you can topple all competition from NITs you get much more than money, recognition. It’s the time to show how sharp is your brain, so do a turn, code till your extremity and be the glare of the moment. 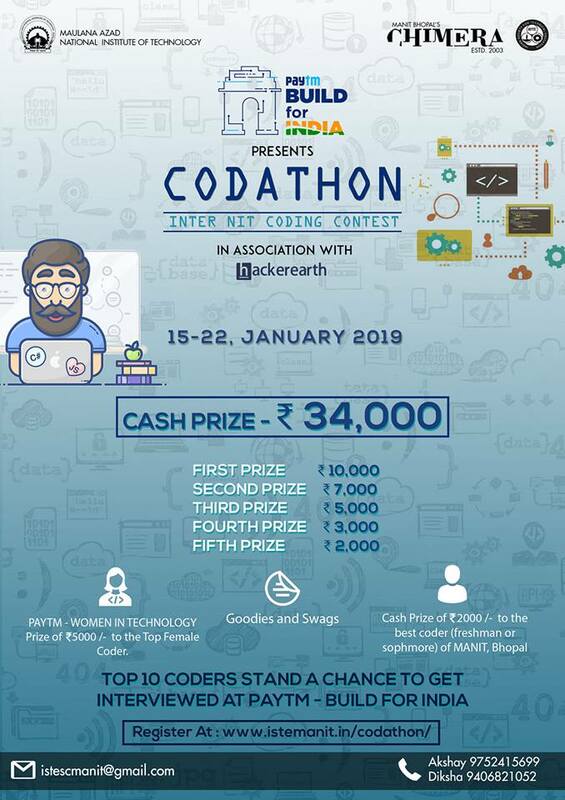 Codathon, Inter-NIT Coding Contest is sponsored by Paytm- Build for India, Coding Blocks and Hackerearth. Best female coder also stand a fair chance to win a cash prize of Rs. 5,000 by Paytm (Women in Technology) and a Hackerearth internship. The top female coder of the contest will get a chance to intern with hackerearth. Along with this, they can also win some exciting goodies like programming books, bags and t-shirts and the cherry on the cake, the top ten coders will get an opportunity to be interviewed at Paytm. Certificate of Participation to all the participants. For registration, please visit the following link. Codathon (15 Jan-22 Jan): An Inter NIT Coding Competition with the enthusiastic participation of 5028. Chimera X (19 Jan- 17 Feb): A National Quizzing Event which began 17 years ago and has now reached 17 colleges across 16 cities. The winners were from Nirma University, Ahmedabad and IIIT Jabalpur and NLIU BHOPAL stood second and third respectively. Megatreopuz(10 Feb- 16 Feb): An Online Cryptic Hunt which has kept even the best of minds guessing. The participation ranged from Bhopal to Delhi to Russia and Romania. Anubhuti: An Iconic Annual Talk Show to celebrate success stories and to motivate the students for a brighter tomorrow. The guests were Dr. P.K Desai the president of ISTE, New Delhi and TN Suresh Kumar, a senior space scientist from ISRO. Social initiative: The ‘giving back’ festival organized by ISTE SC MANIT to showcase the humanitarian side. Chimera Nite: The annual pro-show night to celebrate the good times and people with music, food, and serenity. Noticebard is proud to support this contest as a media partner.